Lock in a great price for Magnolia Hotel Boutique – rated 9.2 by recent guests! The staff were very friendly and engaging. The building has the feel of a venerable old home, and is furnished with period antiques. There is a lovely little rooftop terrace, with three sofas and some tables. The sheets were super-soft. Very friendly. The staff is great. The place is extra clean. The location is close to the action, but very quiet. Interior is beautiful old Argentinian home. Staff is gracious and helpful. Location near trendy restaurants and shops. Staff went out of their way to find a tour guide to show us Jewish history in Bueno Aires, and it was very thought provoking tour. Quaint hotel in the charming Palermo neighborhood. Super friendly and helpful staff with personalized service. Loved the room, the courtyard, and the rooftop. Highly recommended! Everything was spotlessly clean . Edgardo and Francisco were so helpful and friendly. Michelle was great and very attentive. Also Frederico and Alex were a lot of help with local information and places for dinner. They made fantastic suggestions. Magnolia Hotel Boutique This rating is a reflection of how the property compares to the industry standard when it comes to price, facilities and services available. It's based on a self-evaluation by the property. Use this rating to help choose your stay! One of our top picks in Buenos Aires.Boasting bohemian chic décor, Magnolia offers rooms with city views and free Wi-Fi just 3 blocks from Armenia Park, center of the Palermo Soho area. 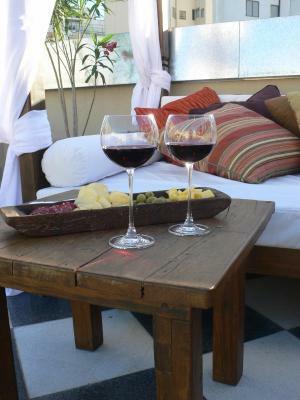 Guests can enjoy a fine selection of Argentinean wines from the bar. 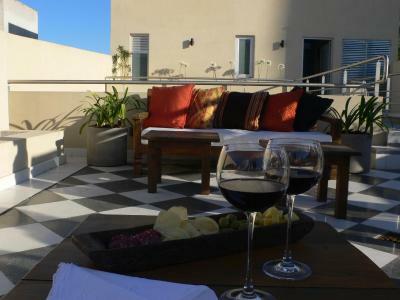 Magnolia Boutique Hotel has air-conditioned rooms with parquet floors and designer style furniture. Some of them feature balconies. 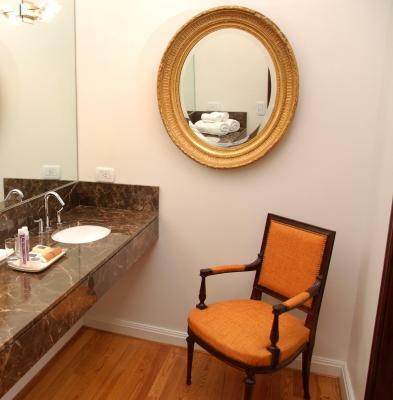 All rooms have private bathrooms with bathtub. 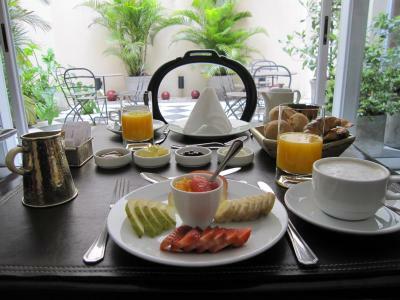 Guests can expect a full á la carte breakfast with croissants, fresh juices, cereals, breads and homemade jams. There is a terrace with sofas and a 24-hour front desk service. Transfers to and from the airport can be arranged. The Botanical Garden is 8 blocks away and Alto Palermo Shopping Mall is 7 blocks from the hotel. Santa Fe Avenue, also 7 blocks away, offers plenty of bus options and subway stops with easy access to the major highlights of the city. Ministro Pistarini International Airport is a 40-minute drive away and Jorge Newbery National Airport is a 10-minute drive away. When would you like to stay at Magnolia Hotel Boutique? This room features a queen-size bed, LCD TV, air conditioning, safety deposit box and a private bathroom. This room features a king-size bed or 2 single beds, LCD TV, air conditioning, safety deposit box and a private bathroom. House Rules Magnolia Hotel Boutique takes special requests – add in the next step! Magnolia Hotel Boutique accepts these cards and reserves the right to temporarily hold an amount prior to arrival. I would suggest making the front door entrance to the hotel more easily recognizable. 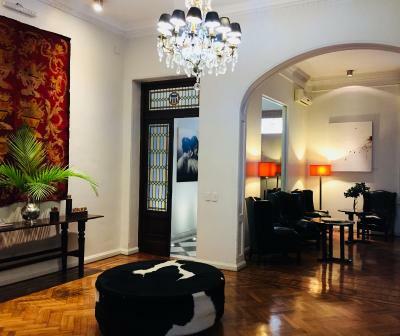 The Magnolia is a lovely boutique hotel in the Palermo district of Buenos Aires. Its antique furnishings are beautiful and add a certain charm to its already warm ambiance. The staff is very helpful. Thank you to Edgardo, Alex and Frank for all your suggestions. Additionally, the breakfast is one of the freshest and tastiest anywhere! No facecloth in bathroom. Safe too small for iPad. No drinking water. They should upgrade their Wifi. Some chairs are in need of fixing or repair. The building was beautiful and filled with character, the bed was very comfortable, the breakfast was delicious and the staff were delightful! Edgardo was particularly lovely and we very much enjoyed our conversations with him. And Alex the owner went above and beyond by hand delivering the passports and money we accidentally left behind. Thank you Magnolia for a wonderful experience. We will stay here again if we return to Buenos Aires. It’s a beautiful house and the staff is very attentive and personal. Breakfast was very good with the best yogurt I’ve had in Argentina. Unfortunately we could stay only one night. Everything. It’s a boutique gem in a brilliant neighbourhood. Proximate to everything. A beautiful, converted old house or home. The team are brilliant, in the background. Incredibly helpful and personable staff - which is invaluable when you’re staying in an unknown city. Beautiful rooms and amenities (including Netflix which is great when trying to get through jet lag). Location is fabulous. The rooms wasn’t great, the bed was not very comfortable, the internet was not working when I arrived and there was a storm and the water entered to my room and bathroom. And booking was not refundable so it does not give you many options in case you are not comfortable in the hotel. All the staff was amazing, really nice, responsive and helpful. The staff on site (Edgar & Alex) are super lovely, and very helpful. They were able to provide recommendations for things to see and do, as well as book specific venues and arrange transport. The mattress on the bed was very firm, giving me my best night's sleep during my entire stay in the country.